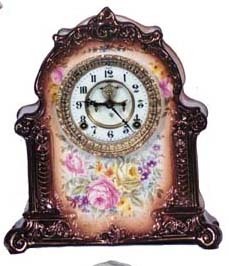 Ansonia Clock Co., "La Mosella", ca 1880\'s, a Royal Bonn. One of the large ones at 12 1/2 inches high, 11 inches wide. Attractively decorated in brown and gold tones, ranging to pink and yellows. This clock is near perfect and came to me from a long time Royal Bonn collector. It couldn\'t be any nicer. This model is not shown in the new Ly-Ansonia catalog, but was in the previous one. Properly marked in every way. 2 piece porcelain dial with open escapement. 8 day movement striking half hour and hours.